The world of Facebook marketing can be a little overwhelming, especially for small businesses. Our guide will walk you through the process. When I first started using Facebook in 2009, I would never have predicted just how influential the platform would grow to become for businesses. Gone are the days where Facebook existed solely as a place for your friends’ (slightly banal) updates on how their days are going. When used correctly, Facebook has the potential to be a huge marketing asset for small businesses. However, the process of actually setting up a Facebook marketing campaign can be confusing, as there really is almost too much information out there. How do you know what to post? How often should you post? Where do you even start? It can feel overwhelming, but after reading you should have a clear sense of the steps you need to take to create a Facebook marketing campaign for your small business. So, let’s get started. Before you dive into Facebook marketing, spend some time getting a clear picture of your existing customer base, and establishing an idea of the ideal customer you’d like to target. Having a sense of who your customer is will help you tailor content to suit them specifically. To get to know your customers, you’ll want to do a little market research. Who are your customers? What is their average age range, gender, location? What do they like, what do they hate, what are their interests? You’ve probably done a lot of this legwork already during the startup process, but make sure to revisit it before you continue. One of the biggest mistakes you can make with your social media marketing is failing to take the time to get to know your audience. The clearer sense you get of who they are and what they are like, the easier it will be to create content that resonates with them. In addition, you’ll want to spend some time coming up with a user persona, if you haven’t done this already during the process of getting your business up and running. Ideally, the new Facebook marketing campaign you’re initiating will bring in new customers and fans. Just as knowing your existing customers helps you tailor your content to suit their tastes, creating a persona based on your ideal customer will help you create focused, targeted content that feels cohesive and unified. If you’re interested in diving deeper into the topic of marketing personas, Buffer has a great guide on how to create them. 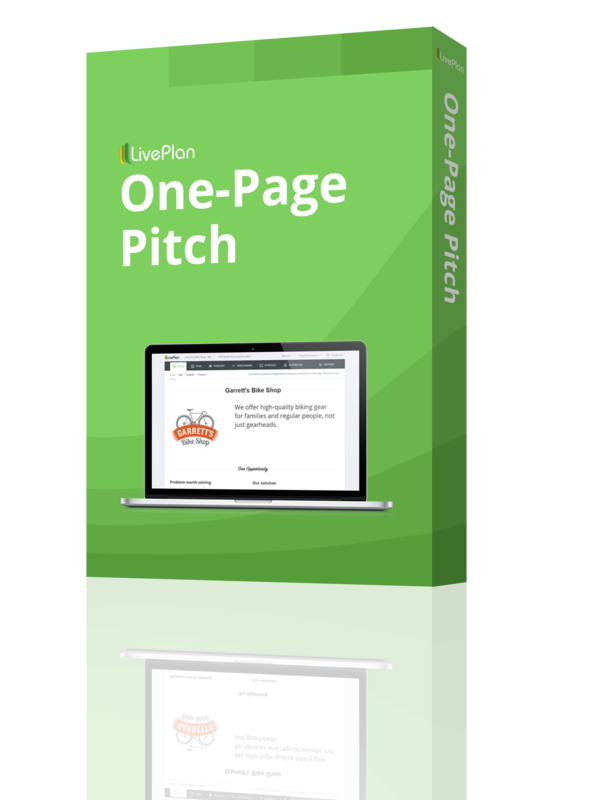 To start, you’ll need to get your Page ready to go. 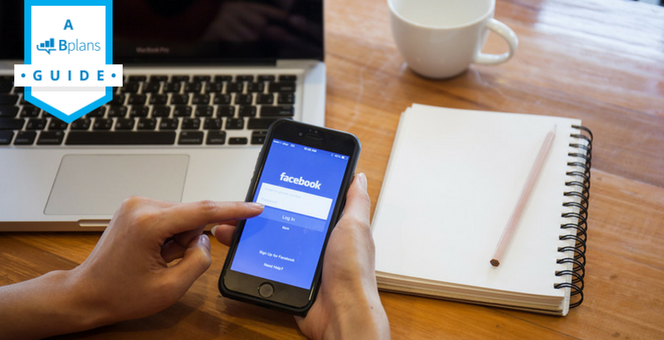 Here are the steps you’ll need to go through before we move into the finer details of your Facebook marketing strategy. First of all, you’ll need to actually set up your Facebook Page, if you haven’t done so already. For this, it’s best to go directly to the source: Facebook itself has information on how to set up your business’s Facebook Page, including a video tutorial. This step is very easy and should take you no more than 10 minutes to complete. Don’t even think about setting up your Page and leaving key areas blank! The first step to a solid Facebook marketing strategy for your small business is to make sure your Facebook Page itself is detailed and complete. At this point, your Facebook Page is functional and ready to go, although still pretty bare-bones. From here, you’ll move on to actually creating unique posts for your Page, and onto creating a strategy to gain followers. 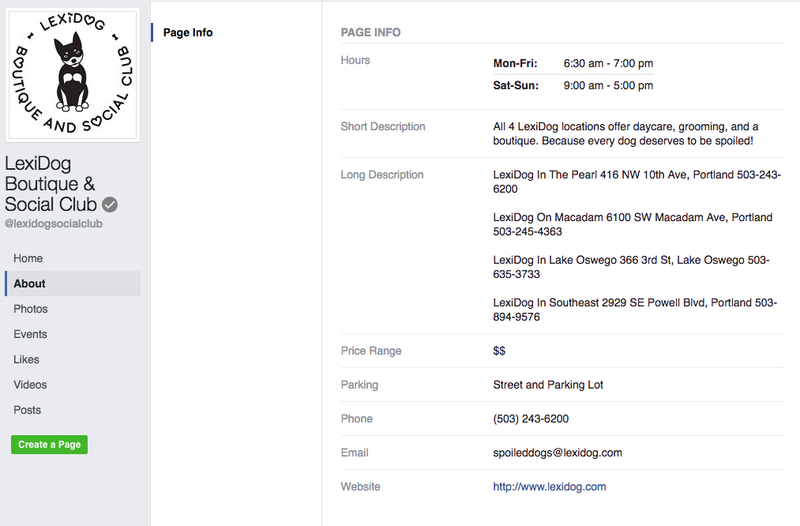 Dog boutique LexiDog has a clear, informative “about” page on their Facebook. So, your Facebook Page is all set up. Should you create content first, or try to find an audience? Ideally, you’ll be working on this step and the next step simultaneously—it’s a bit of a chicken and egg situation. However, for the purposes of this guide, we’ll focus on finding your audience first. This tactic is fairly intuitive, but it’s an important one. Here’s how to make sure your existing customers interact with your new Facebook Page. You’ll want to add these buttons to your existing business website so that customers can “like” you on Facebook. Wired has a guide on how to do this, and here is another one. You may also want to look into adding social media buttons to your website. Have a Twitter or Instagram account already? Tell your followers that you just started a Facebook Page, and include the link to your Page. If you’re sending out an email newsletter, add a mention of your new Facebook Page to your next one (with a link), or create a newsletter specifically letting your customers know you’ve started a Facebook Page. If you have a physical location, create a display, flyer, or card that invites customers to find and “like” your Page on Facebook. 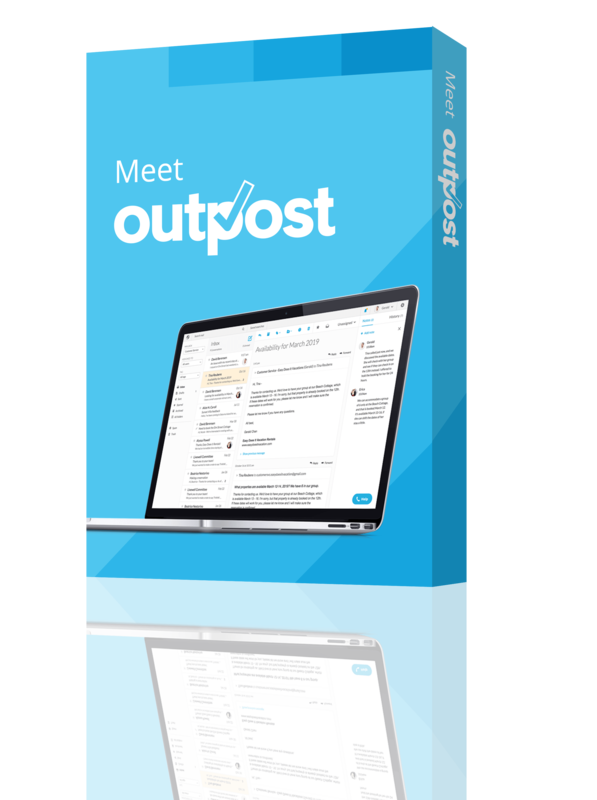 My article on where to find the best offline marketing materials will be a good resource here. Make sure to place these items prominently, and bring them to your customers’ attention. If you run a hair salon, for example, you could place a small stack of cards at the reception desk where clients can grab one as they pay, and you could ask your receptionist to hand them out as well. Now that your existing customers have found you on Facebook, it’s time to expand your reach. To grow your Facebook audience, you will need to develop a strong content strategy. Posting high-quality content that your customers want to see will be key to building a following. We’ll get to what to post on your Facebook Page in the next step, but here are some strategies that will help you grow your audience beyond your existing customers. Building relationships with other local small businesses can be a great way to get your Page in front of new customers. By establishing a reciprocal relationship with another local business, you both gain new exposure. Once you’ve found a business to partner with, you can develop a cross promotion strategy. Share each other’s posts, mention each other, or consider collaborating on a project (a video series, an in-store event, or similar). To continue our hair salon example from earlier, perhaps the salon might reach out to a boutique down the block with a similar clientele base. Make sure that everyone’s personal account is linked to your business’s Facebook Page. Ask your employees to add their place of work, and perhaps occasionally share content from your business’s Facebook Page on their own timeline as well. You probably send countless work-related emails every day—and your email signature offers valuable marketing real estate. You can take advantage of this by adding a “like” button to your signature, or a link that takes readers directly to your Facebook Page. Here’s a guide from Outlook on how to add a Facebook button to your email signature, and here’s one for Gmail. If you are interested in paid marketing, Facebook will put your Page front and center for a potential audience by use of paid promotion. You can visit Facebook’s guide to promoting your Page for more info on how to set this up. However, you may want to hold off on paid promotion until you’ve built up the content on your Facebook Page a bit more. We’ll come back to paid advertising later on in this guide as well. See Also: I Went on Vacation and Increased Our Facebook Traffic by 300%. Here’s How. This is the important part: creating content that will resonate with your audience, help you gain new followers, and make them want to follow your Facebook Page and share what you post. This section will be broken down into a few different subsections, as there is a lot to cover here. To an extent, what content you post will depend on what kind of business you’re running. However, for the purposes of illustrating some of the things you could create, we’ll stick with the hair salon example. Images reign supreme, and there is really no question about it. In a study done in 2014, posts with images had an 87 percent interaction rate, with all other types of content achieving four percent or less. So, plain and simple: You need to post images. But, what kind of images should you post? 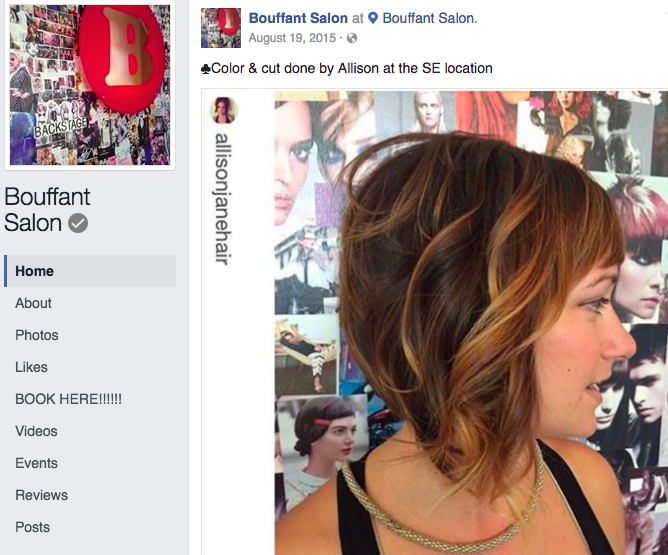 Bouffant Salon’s Facebook Page showcases a variety of photos, including examples of great cuts and colors created by their stylists. Video content can go one of two ways—either you share outside content on your Facebook Page, or you create your own. We’ll get to creating your own videos in a later post (stay tuned for my upcoming article on using YouTube to market your small business), but here is a brief look at a few types of video content you could share. Posting updates on Facebook is a little different when it’s for your business as opposed to your personal account. While you won’t be posting personal updates, having some short, text-driven content is still a smart part of your posting strategy. If you have a blog, you’ll also want to share content from your blog on Facebook. It will encourage customers to engage with you in a variety of spaces, and drive traffic back to your blog. It goes without saying that I couldn’t possibly list all the strategies for Facebook content creation in this article; Facebook is a social media behemoth, and more than any other platform lends itself to varied types of content. The biggest piece of advice? Keep your content offerings varied, and make sure your choice of content and tone of voice is in keeping with your audience (more on tone of voice in a minute). If you’ve read any of our resources on branding, you’ll know that creating a brand tone of voice is essential. However, if you’re thinking the impact of brand tone ends with your website, employees, or the product itself, think again. Your brand’s tone of voice is equally important—if not more so—when it comes to your social media presence. 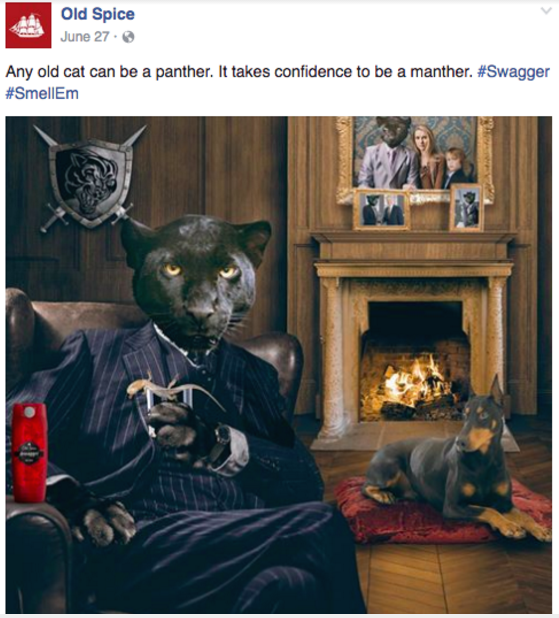 In recent years, Old Spice has become known for their humorous images, videos, and overall tone. Now, what if Old Spice suddenly changed their tune, and started posting humorless updates on their product ingredients, or the history of deodorant? Fans would be understandably thrown off. It’s a silly example, but illustrative of the importance of tone of voice. The tone of voice you choose to use should be a reflection of your products and services, your employees and company culture, and your client base. Cultivating a consistent brand tone may take some time, so make sure you keep it in mind while you develop your content strategy. Now that you have an idea of where to take your content strategy, we’ll get into the finer details of posting content to Facebook. You don’t want to post at random, especially when you have a wealth of knowledge at your disposal on how to get your Facebook posts seen by as many of your followers as possible. By looking at the posting strategies of top brands, it has been found that the average is one post per day, with the sweet spot between “enough to engage” and “annoying” falling somewhere in the range of five to 10 posts per week. In terms of posting multiple times per day, there is a noted drop-off in engagement after the first post, but not enough so as to suggest that posting, say, two posts in a day is necessarily a bad idea. However, it isn’t necessary. Ultimately, your strategy for how often you post will depend not just on industry data, but also on your audience. Depending on your business, you may have more success posting multiple times a day—but you’ll never know unless you plan strategically and track your results. We’ll go over how to track what’s working and what isn’t in step eight of this article. See Also: Can a Facebook Contest Help You Grow Your Business? As with how often to post on Facebook, when to post on Facebook will, to an extent, vary based on your audience. Ultimately, this may mean posting at a variety of times to start, and tracking which posts receive the most engagement (in the form of likes, comments, and shares). It’s important to keep this in mind as your audience will vary a bit from the overall average. So, pinning down exactly when your audience is most active on Facebook may serve you better than simply relying on current best practices. However, there are some findings that may be a good starting place for your business; for instance, Thursdays and Fridays from 1pm to 3pm have been found to be more active times on Facebook for businesses. For a more detailed overview of the best time to post on Facebook, check out the article linked above, as well as this one by Hubspot, which does a deep dive into posting times by platform. If that is the case—or even if you simply want to streamline your social media processes—it’s time to look into automation. Essentially, automating your Facebook posting means that you can create and schedule all your Facebook posts at once, and they will post at selected times throughout the week, without you having to log in each day to do it manually. 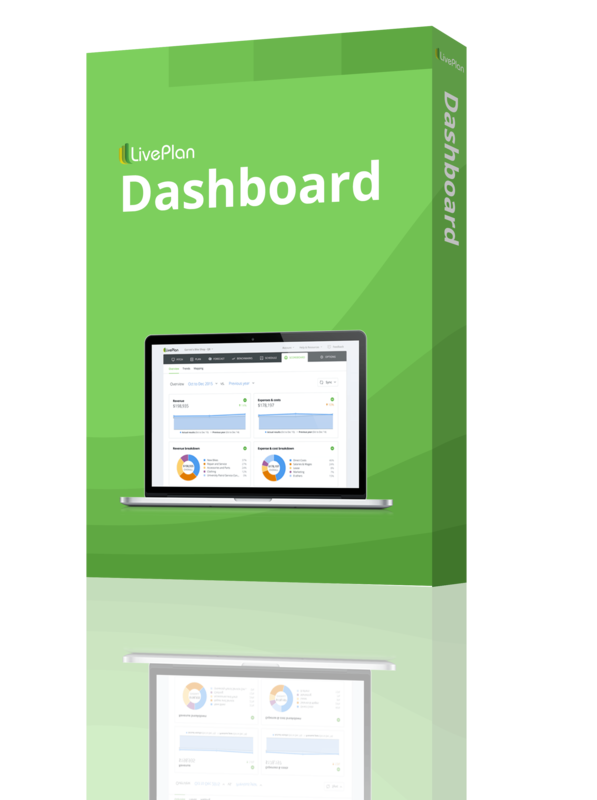 When it comes to posting automation, there are several options. Here at Bplans, we like Coschedule and Hubspot. Your needs and budget, however, will largely determine which SaaS automation tool you choose. You can read more about our favorite marketing tools here. If you’d like to start out free at first and upgrade later, consider this list of free and open source marketing automation software products. Facebook ads were, at one time, a great strategy for businesses; whether they are still worthwhile is a point of contention. Generally speaking, the common consensus seems to be that Facebook ads are a fairly expensive means of advertising and that an effective Facebook marketing strategy is, realistically, fine without them. As there are so many free ways to expand your audience and use Facebook to market your business, paying for advertising on Facebook should be fairly low on your priority list. However, if you are interested in diving into the world of Facebook ads, it is possible to get something out of it on a fairly limited budget. This article from Buffer details what $5 a day can produce, which serves as a good starting point if you’d like to test out a low-cost Facebook ad campaign. Throughout the process of establishing your Facebook marketing campaign, be aware that you can’t just set it and forget it. To really get the most out of a marketing campaign, you should be tracking key metrics and getting a clear sense of what works and what doesn’t. This means getting a sense of what metrics you’d like to track for your Facebook marketing campaign (are you focusing on increasing followers? Do you want your posts to be shared more? Are you trying to get more likes per post? Are you interested in seeing how Facebook actually increases your leads, sales, and so on?) and then tracking how you’re doing. Start by getting a sense of what social metrics matter, determine what you’d like to focus on, and find a tool that will help you track it. 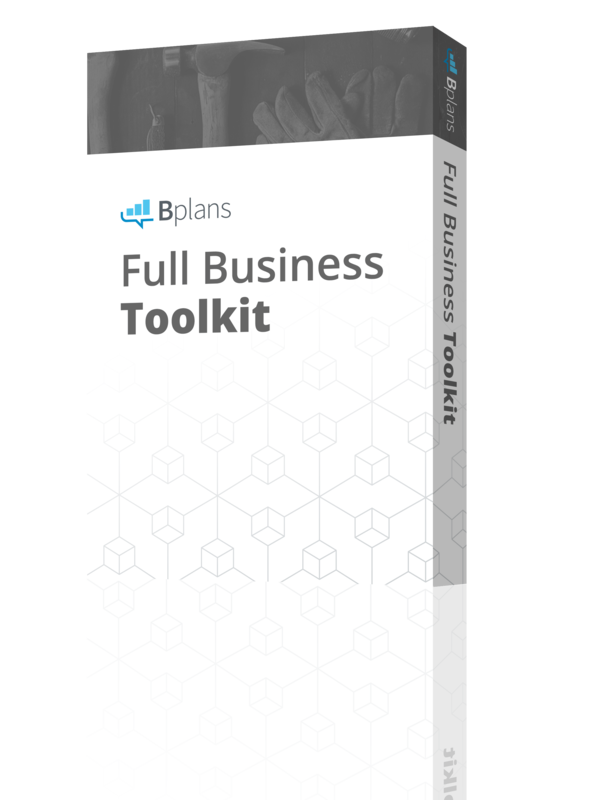 Here at Bplans, we use several different tools to track social metrics, including True Social Metrics, Google Analytics, Buzzsumo, and Sumome. What you use will largely depend on your budget and needs. The important thing to keep in mind here is that for your Facebook marketing strategy to be as effective as possible, it’s important to keep track of what you are doing, and whether or not it’s working. This way, you can continue to refine and revise your strategy, to make it as effective as possible. Clearly, the process of creating a Facebook marketing campaign for your small business is fairly involved. However, if you follow these steps, track where you are successful (or not), and adjust your plan accordingly, you’ll have a Facebook marketing strategy that brings in customers and helps establish a strong social media presence for your brand.